The Packard Foundation believes in supporting and investing in leaders who are at the heart of organizations and movements in order to strengthen a given field or system. After all, people power the programs, strategies, campaigns, and networks working toward social change in our world. While investments in leadership development have hovered at 1 percent of philanthropic funding for over a decade, funders who are working to shift systems, invest deeply in communities, and build sector abilities and strengths for the long term are increasingly turning to leadership development opportunities to achieve mutual goals. How do we know these investments are working, especially when we don’t expect to see results from most leadership projects until years after funding is given? Are there best practices in measuring and monitoring leadership investments that will help with the design and implementation of future programs? 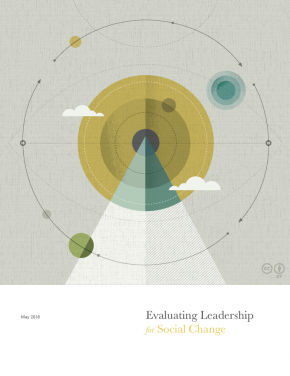 The resulting report, Evaluating Leadership for Social Change, showcases a comprehensive framework for approaching leadership development evaluation and learning. The report provides evaluators with a set of tools and questions to consider in the design of evaluation approaches for leadership development. In a companion piece to this report, ORS Impact also developed a draft typology tool for leadership development to help categorize and name the many shapes of leadership investments. At the center of the report’s framework is the relationship between the leadership investments and a funder’s theory of change. When the link between the theory of change and the leadership investment is determined, it clarifies the types of measures and methods that may be most useful to all parties engaged in the work – including funders, trainers, and participants. In addition, because the results of a leadership investment change from one period to another, the element of time and what is measured when is an important component of any leadership development evaluation approach. Here at the Packard Foundation, we are trying out these evaluation tools on some of our leadership programs. If you apply these frameworks on your organization’s leadership investments, share your findings with us. We’d like to learn what you find to be most powerful in measuring leadership development.